Lately I find myself warring between writing well and writing quickly. I want to share the information I have as quickly as possible, but my life is incredibly full and full of interruptions. Even though I used to be much faster, I am pretty slow at writing now. As a mother of 5, a Gran of 1, and a constant host to many other children, I feel like my ADD only gets worse over the years. Five solid minutes to myself, even when I’m in the loo, is rare. Keeping one strand of thought in my head at a time is nearly impossible. On to the goodies. . . This post is mostly about tweaking that method to make the not so round necklines. The internal area of a triangle is less than a circular shape of a similar size. Let’s start with our basic perpendicular lines with points A, B and C on it (see the previous blog post). The opening for the back of the neck will be the same rounded shape. Go ahead and connect point A to the point on the horizontal line in a very rounded way. I often use a French curve to get that nice round shape, but that’s not necessary. To give the hole more space for the head opening, add an inch or so under point C . In this example, we are making a rounded triangular opening. I usually start by making a straight line connecting the point below C to the point on the horizontal line. You can see a bit of the erased line on the image below. Like we did with the rounded necklines, fold the paper in half along the vertical line and cut out both sides of the hole at once. To get a hole that has a bit more of a straight edge, do not round out the line as much or at all. Again, start with your perpendicular lines and points A, B and C.
Below point C, add an inch or so. Connect point C with the horizontal line. With a slightly slanting line, connect point C with the point below it. To make a neck facing or a contrasting colored neckline, start with any of the principles above. 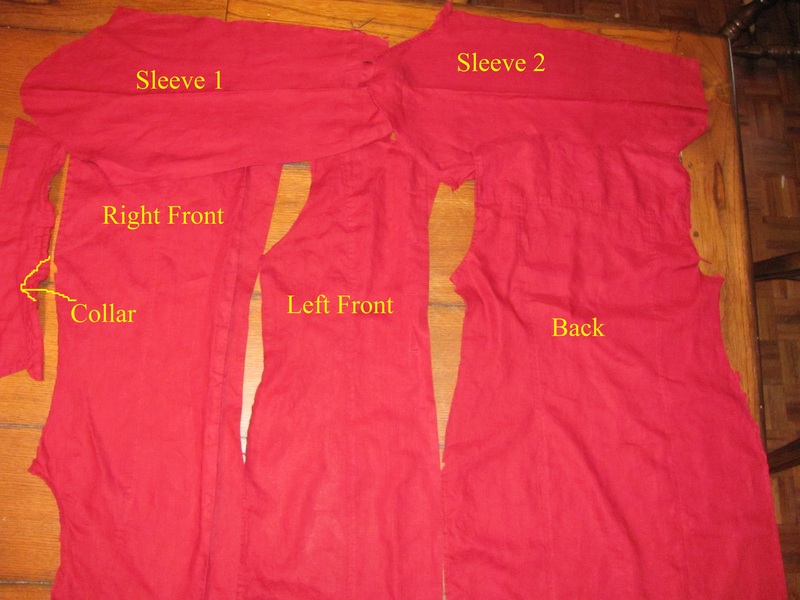 Outside of each point, add the desired width of the facing plus a hem allowance. Connect all of the points together in the same basic shape as the original hole. Some period neckline designs combine different hole shapes and facing shapes. It produces a really cool effect. An example of a triangular hole with a square collar is below. I like to keep the back edge of the hole round. Whether or not your follow that curve with the facing is up to you. The square neckline is constructed more like the round neckline than the triangular. You have points A, B and C on your lines. Round the back of the hole. From the side point, go straight down until you are even with point B. From the end of that line, make a rounded or straight connecting line to point C .
That’s it. Fold the paper in half and cut it out. Same principle as with the round facing, mark the desired width plus seam allowance outside of the basic points and then connect them. I love this neckline shape and it is totally period! I lump it in the same category as the squares since it is made with a similar method. From the point on the horizontal line, go straight down until the line is even with or a little below point B. From the end of that line, make a curved line joining it with point C .
Take the same principle to make a square opening with a center slit. 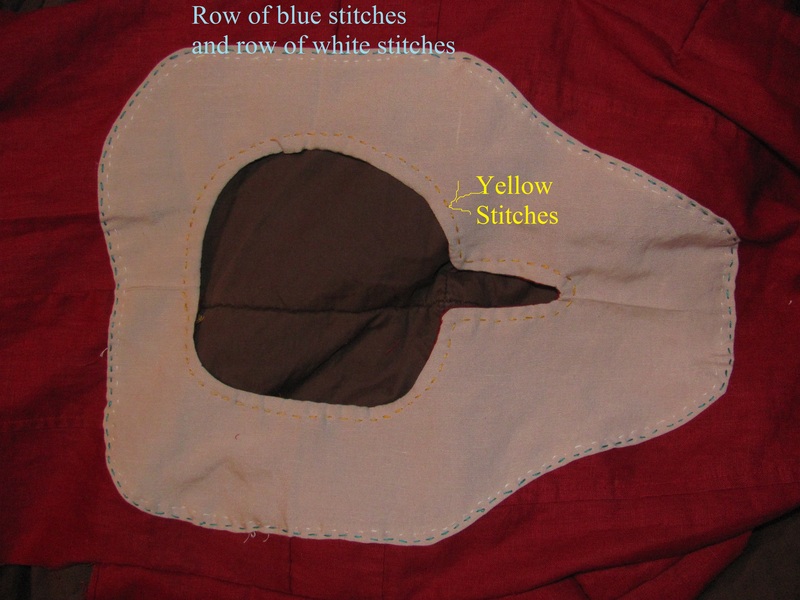 Stay stitching is a basic straight stitch made along the edge of the fabric, usually a curved edge. This prevents the fabric from stretching out and distorting. If you are not using a facing or contrasting colored neckline, make a stay stitch around the opening of your neckline. Like in tip 2 (see previous post), you can do this before you cut out the neck-hole. If you are going to embroider the neckline or contrasting neck facing, do this before you put the neckline together. A stay stitch along the edge of the contrasting fabric is also a good idea. Next up in the neckline series . 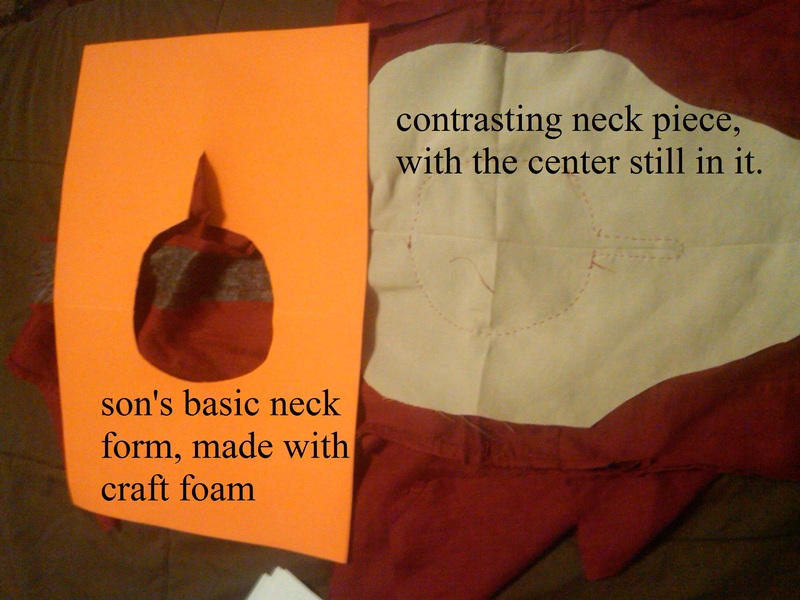 . . instructions and pictures of actually making a neckline. This may be a while since I have to do it and take pictures before I post. Until next time – go make some garb!! Continuing on where we left off, we’re going to explore how to pattern necklines based off of your body dimensions. Whenever I talk to someone about their garb, I always ask them what they do not like about the garb they currently have. Rarely do they dislike how it looks. Most often, it is the fit that makes them like or hate their garb. About half of the time, it’s how the garb fits in the shoulder area, and the other half is the way it fits in the neck. If the neck is too tight, it feels like it’s choking you. If it’s too loose, you get a sunburn in weird spots or you feel the need to keep adjusting it so it does not fall off. 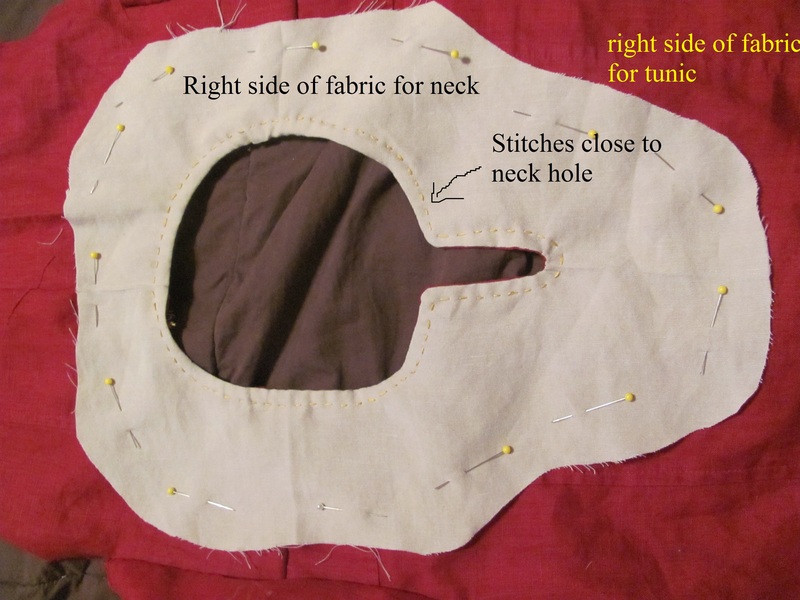 Most people new to making garb fall into the trap of making the neckline too big, and it is very difficult to make it smaller again. Over the years I’ve tried several ways of measuring and patterning necklines, from using the neck and head circumference in a long math formula to holding up a clear quilting measuring square and plotting out the neck shape from there. I’ve not had much luck with these methods despite that they seem like they should work. I tested her trick out over the years and made my own modifications. Remember that this is a general technique that works with my family. You may need to adjust it depending on head shape and neck size. With this method, you end up with the smallest possible neck-hole that will fit over your head. If you want a larger opening or something that is scooped or shaped differently, use the method as a starting point. Begin enlarging by adding length to the front, not the back and definitely not the sides. Adding length and width to the back and sides will make an ill-fitted neck-hole. With children, use this method as a starting point. Children’s heads are not proportional to the rest of their body and are almost always big compared to their other parts. We are working with only one half of the neck-hole. Whatever pattern we end up with, we will fold the paper in half along the vertical line (up and down line) and cut out both sides at once. This way, we have a neckline that is the same shape on both sides. Left or right, it does not matter. I find it easier to work with my left hand because I am right handed. Take a large sheet of paper or tape several sheets together. Near the center, draw a set of perpendicular lines. On the top section of the perpendicular lines, mark the width of your first two fingers at their widest. On my hand, my first two fingers are the widest close to the knuckles. On the left (or right) side of the center, mark the width of your 4 fingers at the widest. On my hand, my 4 fingers are the widest where the fingers and palm connect. On the bottom section of the lines, make a mark the width of the widest part of your whole palm, including your thumb. On my hand, this point is just below the thumb. At this point, you have a mark on the top and bottom of the vertical line and a mark on either the right or left of the horizontal one. Label the top mark A and the bottom mark B. Measure the distance from point A and point B. Write this number down somewhere. Measure around your head where it is the widest. My head is the widest near my temple, but depending on your head shape you may need to measure over the ears or nose. Write this number down as well. Take your head circumference and divide it by 3. Take this new number and subtract the length of AB from it. Add that amount to the bottom of your lines and mark it point C.
If you are lost, that’s fine. I’ll show you what I mean. After measuring my hand, the distance between points A and B is 6 inches. My head is 21 inches around where it is the biggest. Just below point B, I add 1 inch and mark that point as point C.
If the circumference of your head does not divide evenly by 3, use a fraction. For example, 22″ would be 7 1/3″. 23″ is 7 2/3″. This plot is what we will use to make all of your neck openings. Let’s start out with your basic round neckline. This is fairly easy. Connect point A to the mark on the horizontal line. The tendency is to go straight across, but round it out instead. I use a French curve to make sure that I’m getting the most rounded line I can. Connect point C to the same horizontal mark. Again round it out. That’s it! That is your neck-hole. For the basic round neckline, you will ignore point B. Do not adjust this hole for seam allowance or hemming. The opening works best when it is opened a bit more by hemming it or sewing it to a facing with 1/4″ allowance and clipping the curves. Now fold the paper in half along the vertical (up and down) line and cut out the half circle you drew. When you unfold it, this is the smallest possible round neckline that will fit comfortably on you. If you want it larger, start by trimming on the bottom. 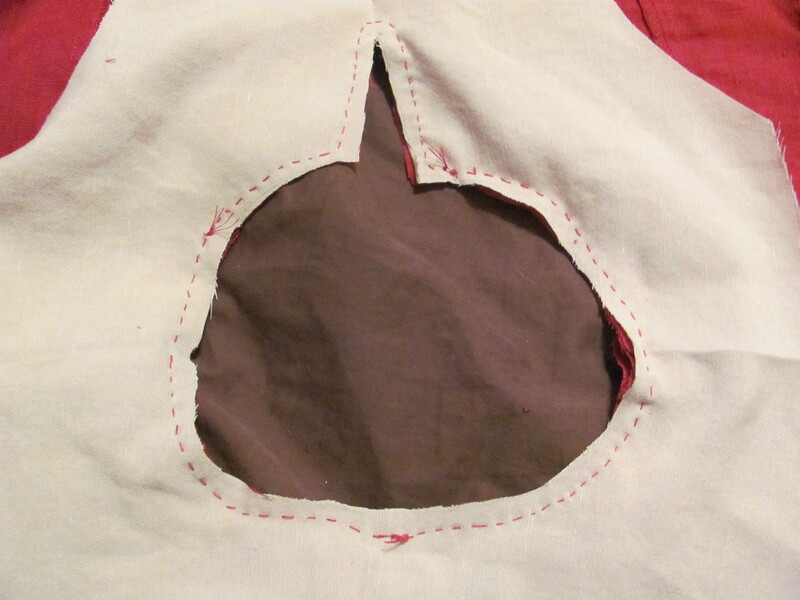 Once your have your basic shape, you can use the shape to cut out your neck-hole or you can use it to make a neck facing or contrasting color of fabric. How wide do you want the facing or contrasting fabric? How big of a hem do you need on the facing edge? Add these two numbers together. (I usually do a 2″ facing with a 1/2″ hem allowance, making my sum 2 1/2″). From points A and C and the mark on the horizontal line, make a mark the length of your sum. For me, that is 2 1/2″. Label these marks D, E and F. Connect D, E and F with a rounded line that follows the curve of your original half-circle. The top line becomes the center back. The bottom line becomes the center front and the two side lines become your shoulder lines. Many people like the tighter neckline, but they need a bit extra of an opening to get their heads through. You can accomplish this with a slit in the front. Instead of connecting the horizontal point to point C, connect it to point B. Then from B to C make a small diagonal opening. That’s it! It gives you a tighter neck so that you don’t burn as much, but the slit makes it so that you can pull the tunic over your head. To make the facing, use the same technique as your did for the round neckline, but make a key shape around point C.
Cut out and finish the neckline right after you have cut out the body and before you sew any side seams. Most people do the neckline last. Why? At this point you have to work with fabric that is not flat but is curved by the sleeves and side seams. Why not start with the neckline? If you cut out and finish your neck right after you have cut out the body and before you do anything else, you work with a nice flat piece of fabric. It not only makes it easier to sew, but it will lay better when you have finished the garb. If using facing or a contrasting color, sew the neck and the body together before you have cut any holes out. Yeah that sounds weird, but fabric moves. And once you cut a big hole in it, it will move even more. Cut out your body. Mark your shoulder points and center front and back on the body piece. Cut out your neck facing or contrasting neckline fabric. Mark the shoulder points and center front and back on the neck. Using your paper template, mark the hole on the neck facing with tailors chalk or a water soluble fabric pen. Pin the neck facing to the body piece. Sew them together right on or a 1/4″ outside of the neck hole line you drew. Now cut the neck hole out, turn the facing over and stitch or hem it to the body. I have the diagrams for making the other shapes, but I’m done for the day. My kids, which I homeschool, need to start their lessons and it’s already 11:00. More later. A survey of different styles of necklines from period sources. 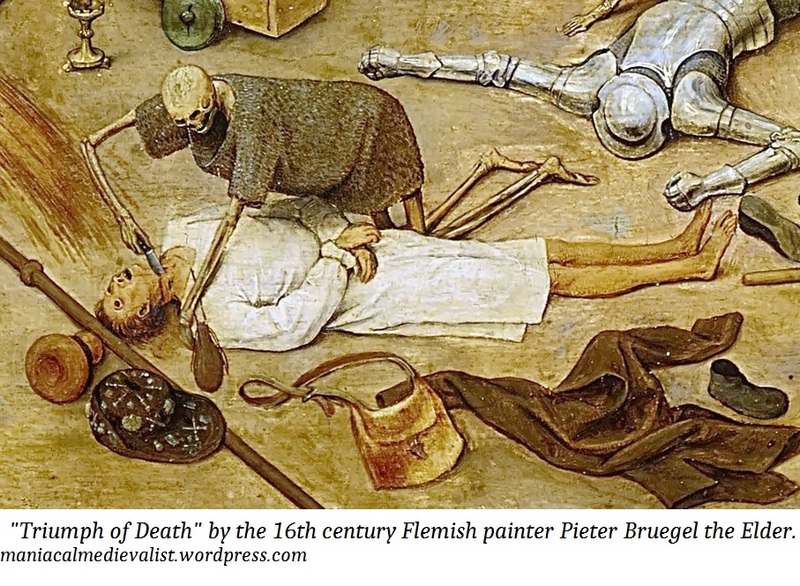 Take a look around at the clothing most medieval re-creationists wear. The vast majority have the same neck-hole – round or round with a front slit. There are variations, but mainly in the decorative contrast fabric. From what we know of period clothing, from both extant pieces and art, necklines were more varied than what we see. My purpose here is more to inspire than to educate. All of the necklines that I sketched are from period art sources, mostly manuscripts but also art such as monuments or paintings. The necklines are divided into three categories based on the shape of the opening: round, triangular and square. I did not find many necklines that went outside of these categories, but within each category there is a-lot of diversity. My attitude is that you never should HAVE TO buy new fabric for children’s garb. You can find better and cheaper fabric by looking with a creative eye and an open mind at your local thrift store. At least that’s what I do. Luckily for me, one of our local thrift shops (America’s Thrift) sorts everything by size. The easiest way to find good, period fabric, such as linen or wool, is to start with the largest sizes and work your way down. I searched through women’s clothing looking for the largest red linen shirt or skirt I could find. 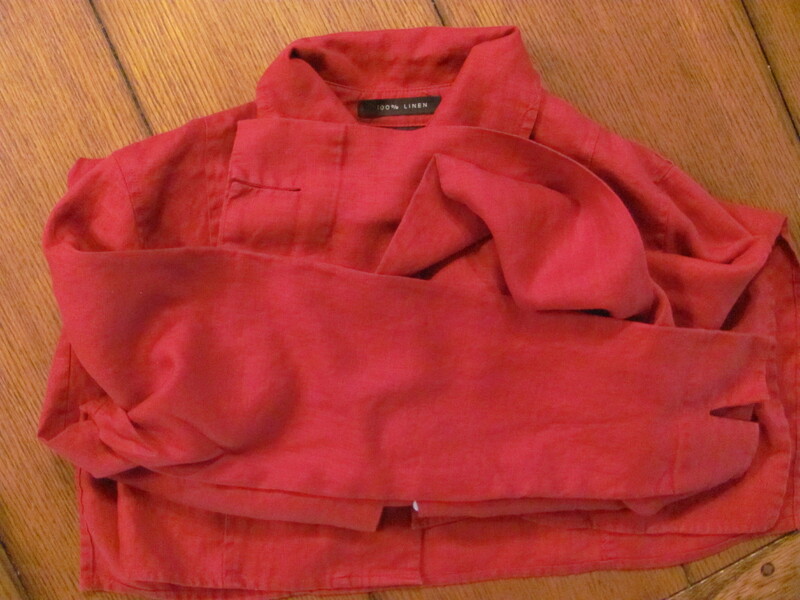 The red linen shirt, I settled on, was made with a very nice lightweight, tight weave linen. For the contrasting neck and sleeves, I found an off-white linen skirt. I wasn’t using much fabric for the contrast, so any size would have done fine. Both purchases together cost about $2.50 – I also look for deals even when thrift store shopping. Little known thrift store tip, many, many people buy linen clothing because it looks great at the store with the sizing still on it. Then they don’t know how to care for the linen and get rid of it. I find countless brand new items of linen clothes all of the time. My entire mundane wardrobe is nearly all linen (I live in southern Louisiana, so do you blame me for wanting to stay cool?). 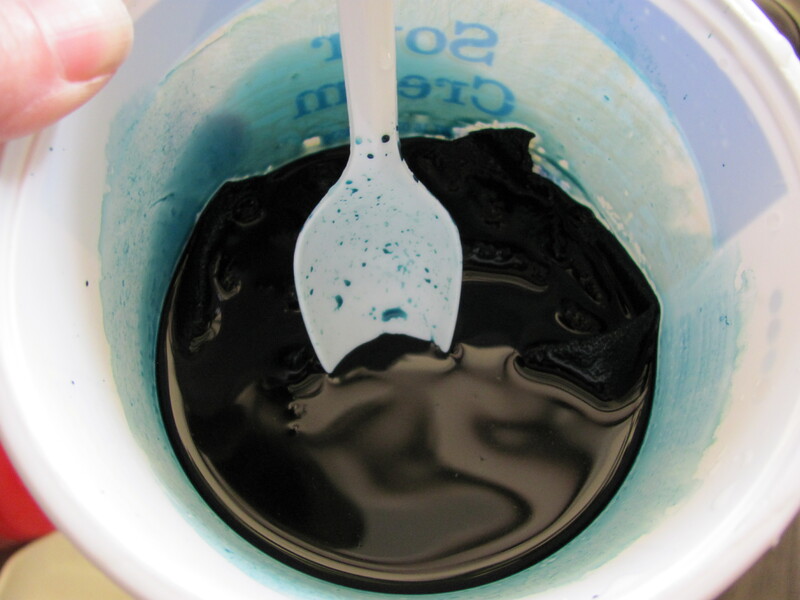 Once you get home with the item you are going to re-purpose, wash it well in warm water. And dry the heck out of it. Any warping of the fabric or fading of the dyes you want done before you cut it. The linen shirt I found. I think it was either a 1X or a 2X in size. 100% nice linen. Now iron it flat. Cut it along the seams into as many large flat pieces you can. Even if those pieces have seams, as long as it can lay flat, leave those seams in. Blouse cut into flat pieces. There is still a seam running down the back piece, but since it laid flat, I left it. Now use those pieces to cut the pieces you need for the item you are making. Pieces for son’s Viking tunic. 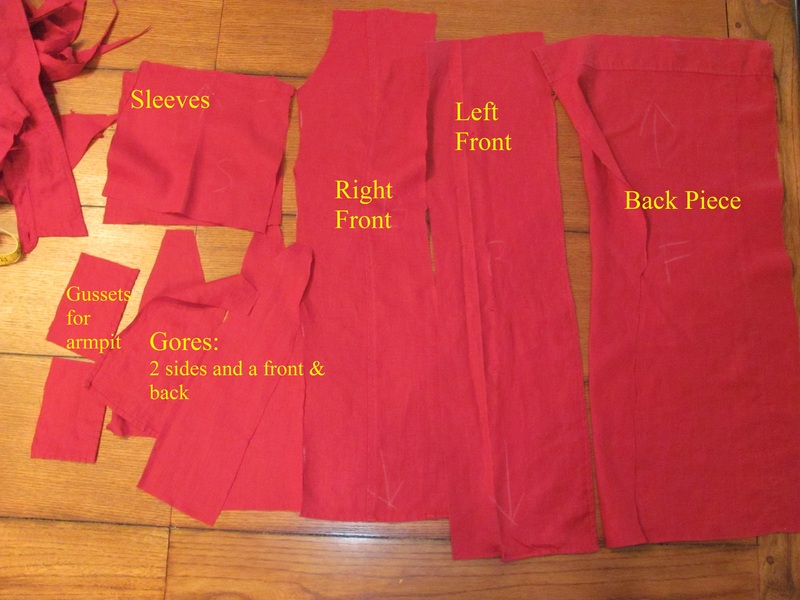 Reverse the front and back pieces – I confused them when labeling and am too lazy to relabel! 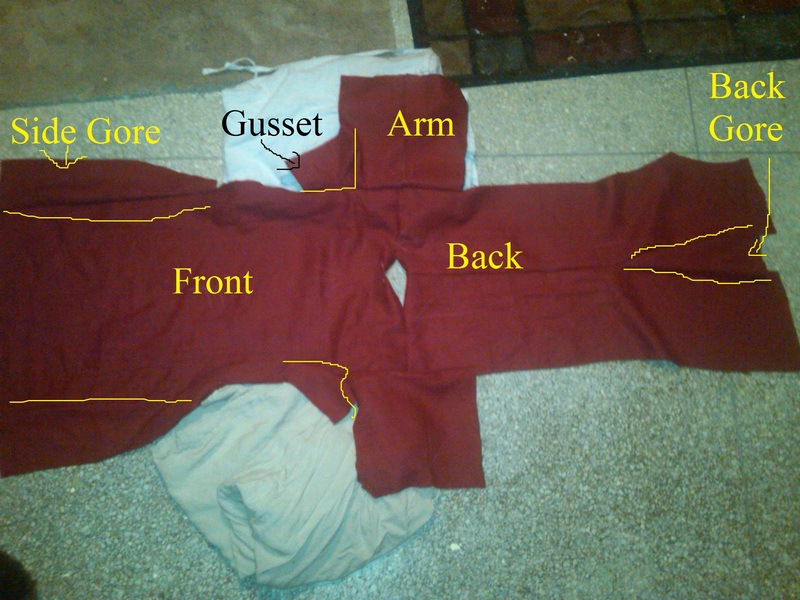 I have a method for patterning tunics using only the person’s measurements. I have an idea that all garb construction can be reduced to mathematical formulas. It’s just an idea right now, but one type of garb at a time I’m working the math out. My tunic method mostly works. I still need to tweak it a bit in places, but I’ll definitely post my method once I have it just right. I used my method making this tunic, and it fit my son perfectly. 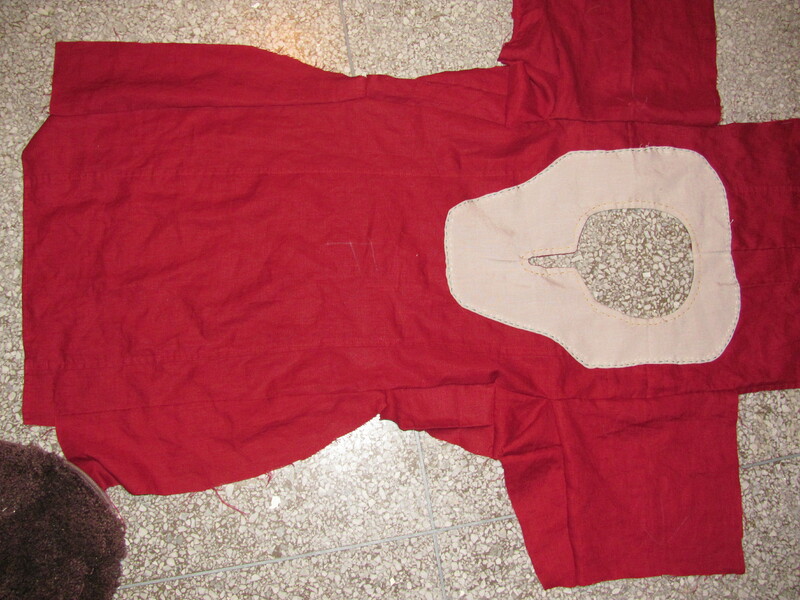 After much experience, I found it easier to make the neckline before the sides are sewn up on a tunic. Neck line basted onto tunic. Each family member has a basic neck pattern for tunics and such. I make it with craft foam since it’s more durable and flexible than paper. I also have a mathematical formula for making neck holes. I’m still working on that too. Another tip, leave the center neck hole in the neck piece while basting it to the garment. It makes it much easier to pin the garment and neck together. Remember, pin the right side of the neck line to the wrong side of the shirt. I cut the hole out of the neck. I’ll trim the seams a bit closer to make it fold over easier. 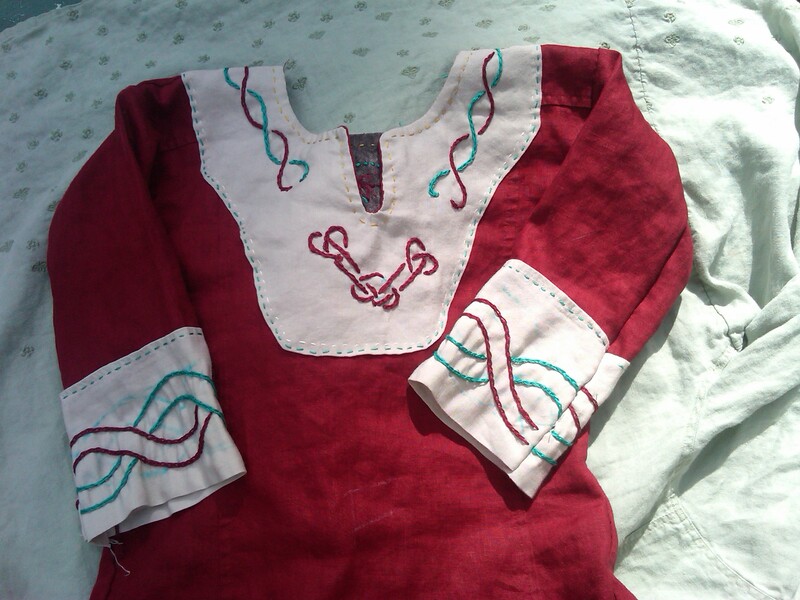 Turn the neck line piece so that the right side of it is showing on the right side of the tunic. 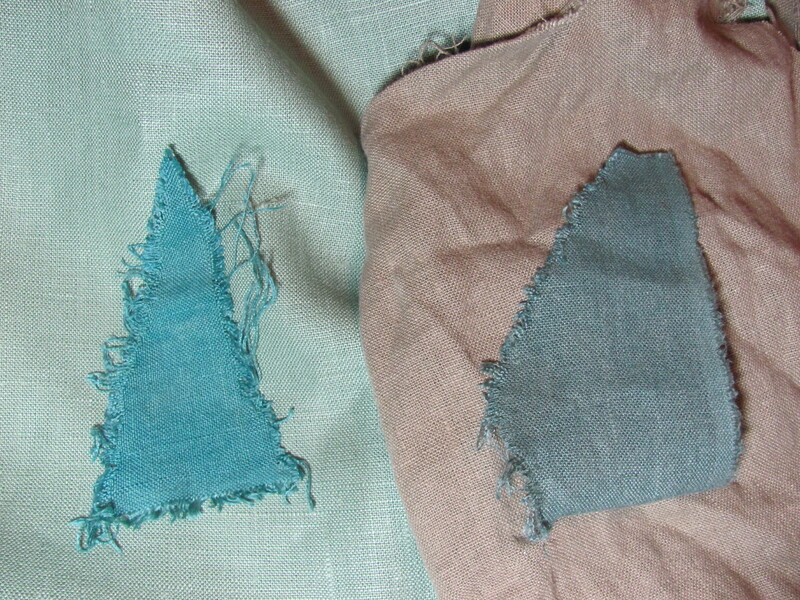 I then placed a small row of stitches around the hole to stabilize the fabric. These stitches can be removed once you are done with the neck, but I left them on as decorative stitches. I added a decorative row of blue stitches and another of white stitches along the edge to tack the hem down. All that’s left is to sew up the sides. Before I sew the sides and hem the bottom, if I want to add any embroidery or other embellishments, I do them now. It’s easier to embroider a flat piece than having to stick your hand in and out of a tunic. Here it is all done. I did a bit of split stitch embroidery on the neck and cuffs to spruce it up. 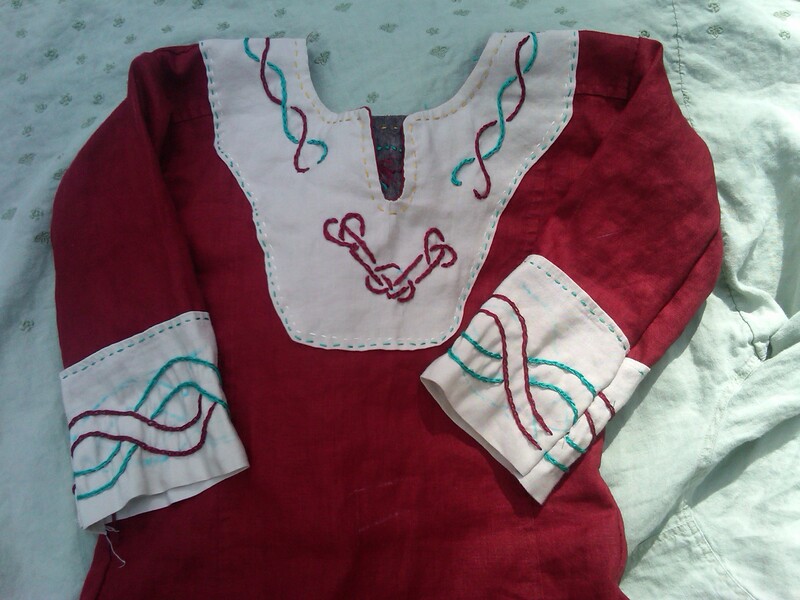 Besides the embroidery, it took me all-in-all about 2 hours to make the tunic. My little dude loved it, and I’m very happy with it. During a trip to JoAnn’s Fabrics yesterday, I bought several sizes of tapestry needles. 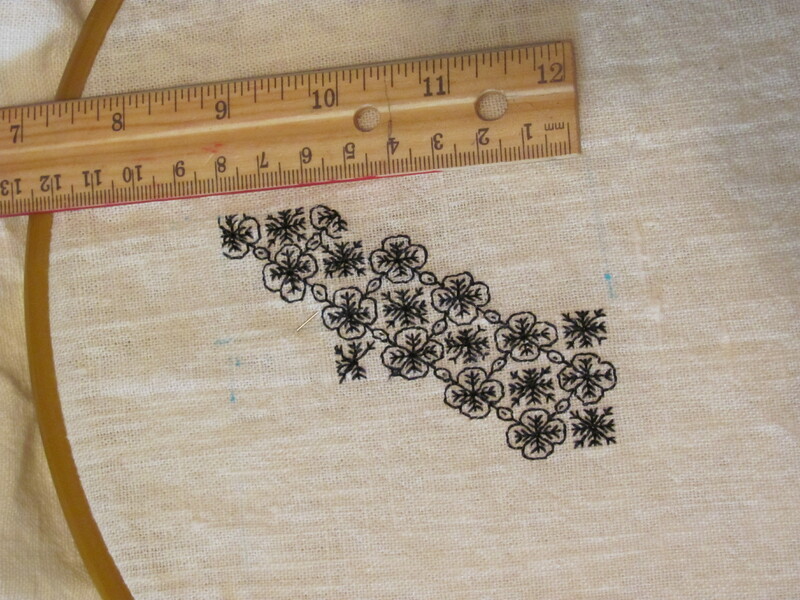 Their blunt ends, I found out, work better with certain types of embroidery, such as blackwork. Since the tips aren’t pointed, they are less likely to pierce a thread. My discovery was that in any type of counted stitch embroidery (example: 2 threads up and 4 threads to the left), you want your needle to go between the threads of the fabric rather than through a thread. The blunt ends push the threads aside instead of piercing it. My next step in this journey is to learn what the different types of needles are better for doing. After all, they wouldn’t make different styles, sizes and types if there wasn’t a reason. A large part of learning something new is discovering the un-obvious and learning those things you never knew mattered, or sometimes never knew existed. It’s not just about mastering those steps that you know of, but learning all those little details, new terminology, and minor bits about which you’ve never heard. Sometimes it’s the little things, those things that no one thinks to explain because anyone who’s done it for any length of time knows, which I find frustrating. Types of needles are one of them. As the name implies, they have a sharp point. These are the most common type of hand-sewing needles used. Good for knit fabric since it is less likely to snag the threads and un-do the knitted fabric. Used for projects where you go between the threads. The blunt point pushes the threads to the side so that it is not pierced. General sewing needles. Eye is large enough to fit normal sewing thread. Sharps: general purpose sewing. Sharp with small head that is good for working with normal sewing thread. Better for sewing that uses multiple threads, thick threads or yarn. Tapestry Needles: have a long eye but a blunt point. Generally a little on the thicker side. Can pass through fabric without piercing the individual thread. 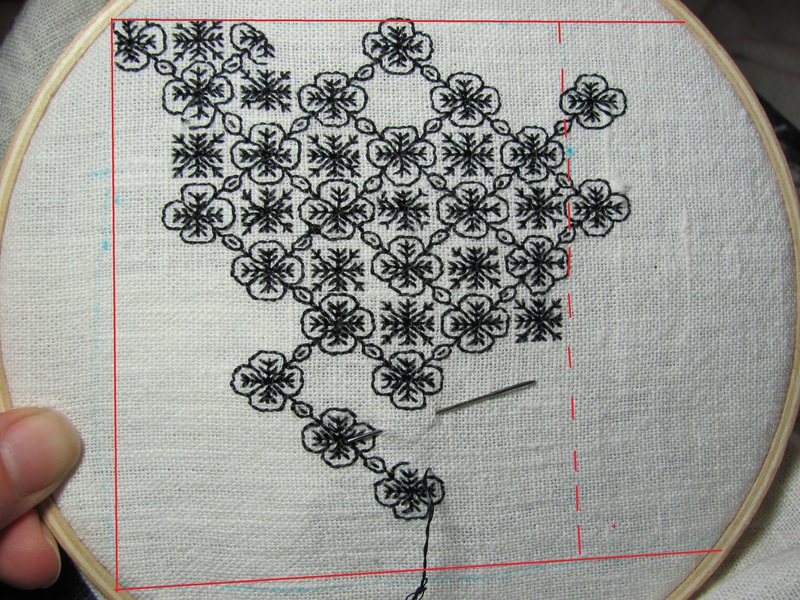 Good for blackwork or other counted stitch sewing. Chenille Needles: Large eye and thick like a tapestry needle, but with a sharp point. Used for going through thick, closely woven fabric with multiple or large thread, like ribbon or wool embroidery. Quilting Needles: short and sharp. Good for small stitches used in quilting or going through thick fabrics that need small stitches, such denim or when hemming pants. General use. Most things you do can be done with a medium length needle. They are made for hat making, but can also be useful in any circumstance where large basting stitches are needed. Milliner Needles: long and sharp with a small eye. Since the eye is not much bigger than the shaft, it can also be used for beading. Light-weight fabrics so that the hole made is tiny and doesn’t affect the fabric much. In some work, like embroidery, you want the hole in the fabric big enough for the thread to pass through without a problem. 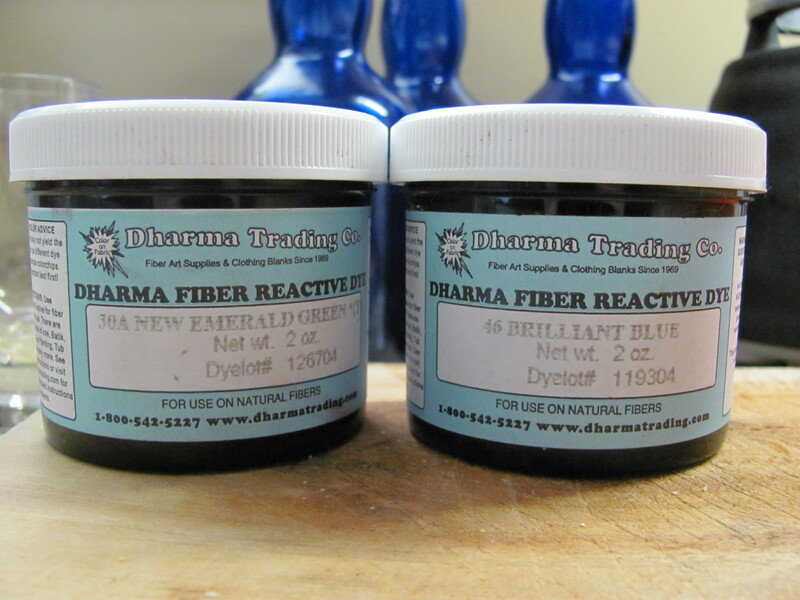 Especially with using silk thread, you don’t want the thread to struggle being pulled through. Some needles have a sharp point with a thinner body that tapers up to a larger head, even a diamond or triangular shaped head. These are good for getting through fabric that needs a sharp point and making a large enough opening for the thread to pass easily through. Now what does all of this have to do with a needle case? Now that I have so many types of needles, I want to use the correct one for the correct circumstance. Thus, I need a way to organize them. Now, if Jo-Ann Fabrics had simply had a decent needle case yesterday, I would not be here. Since they didn’t, my need for a simple needle case has become much more complex. I now want a needle case that organizes my needles by type and size, has a pocket for my embroidery scissors and looks like it could be found in the 14 to 1500’s. It doesn’t have to be historically accurate, but I don’t want it to be glaringly modern. That’s what I’m working one today. Pictures will follow.